Seven million tourists spend more than £600m each year in York, according to new figures. The research, based on leisure and business visitors in 2012, was the first to be commissioned by tourism agency Visit York since 2008. Tourism supported about 20,000, or one in five jobs in the city, the economic impact research said. 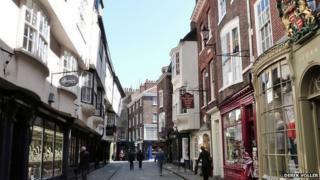 Visit York said tourist numbers had remained the same but spending had risen from about £440m in 2008. Food and drink was the principal area of spending, followed by retail. Visit York said overnight visitors make up around 22% of all tourists to the city but account for the bulk of spending at £399m a year. The research also revealed most foreign visitors to York come from North America, Australia, France and The Netherlands. Sonja Crisp, cabinet member for tourism at the Labour-run council, said: "It's clear that visitors contribute significantly to the city. "Our aim has always been to concentrate on increasing the value of tourism in York, so we're delighted with these latest results and we will continue to build on this success."